This ultra-rugged, lightweight external hard drive protects your data from drops and operational vibration with patented technology. Bus powered USB 2.0 capability. 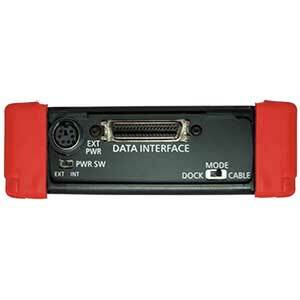 Use with standalone cable or in a tower/19″ rack. Most Portable Hard Drives Are Too Fragile To Survive a 6-inch drop! What Makes a Great Rugged Portable Hard Drive? There are many portable hard drives. However, most – including models that claim to be “rugged” are too fragile to be moved around safely and are not even close to meeting the Military Standard MIL-STD-810F transit drop test! That’s because most have no shock protection or use outdated technology. We developed a portable hard drive, the Mobile DataVault 2LX, with proprietary shock protection technology that not only meets, but easily EXCEEDS the MIL-STD-810F transit drop test. This test requires surviving 26 4-foot drops on all surfaces of the drive onto a hard surface. You won’t find a more durable and versatile portable hard drive. And its less expensive than most military portable hard drives. Hard drives are at risk of damage with couple-inch drops, knocks, or bumps. The Mobile DataVault 2LX is among the very few portable hard drives that features patented ULTRA-RUGGED SHOCK PROTECTION. Most portable drives, including a few that claim to be “rugged”, do not pass the Military Standard Transit Drop Test MIL-STD-810F. Unlike flimsy hard drive enclosures, this product is a complete assembled solution with much higher shock protection. Our drive not only passes this standard, it exceeds the standard. Our portable hard drive uses highly reliable internal drives and provides over 10,000 Gs of patented shock protection in a high-impact case, which keeps your data protected from drops. This drive exceeds the very challenging MIL-STD-810F Transit Drop Test. Choose from 500GB to 1TB of native capacity – much larger than flash drives, and equal to hundreds of CDs and thousands of floppy disks. Capacity is larger than most tapes. With 5400-7200 RPM, this drive can move a Gigabyte data in less than 40 seconds. We confidently provide a two-year warranty, including coverage for any damage caused by drops! This drive features plug-and-play functionality with Windows 2000+, Macintosh OS, and Linux. Our USB 2.0 cable powers the drives from most brands of laptops. At 4.4 x 7.5 x 1.4 inches this drive is about the size of a VHS tape. Can be used interchangeably with USB 2.0, or plug into a 5.25″ docking bay! Available via GSA contract GS-35F-0538P.